CURL families have lived in the village for many years. On the 1841 census record there are two families with that name. Thomas an agricultural labourer, his wife Ann and their three children lived in Poors House. Which we guess is a wrong spelling for Paws House, which is in Paws Lane, the road that leads to Pentney. There were another family of Curls, James, also a labourer, and Elizabeth, with their 5 children. We do not know where they lived. Percy Curl was born in the village in 1898, and lived here all his life. He was a stalwart of the church. As a boy he stood by the brass lantern to turn the music pages for the organist and was later the verger and grave digger. He married Daisy and they raised four children in cottages on the main road. Daisy too, cared for West Bilney church. Picture is of Percy and Daisy Curl. 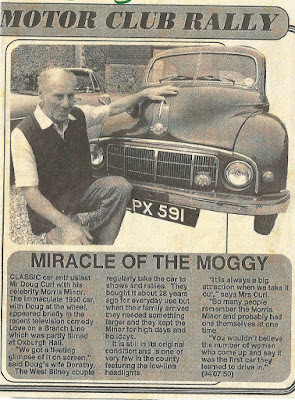 Doug their son, apart from a short period in Hampshire where he married Dorothy, also spent his life in the village working for Mr Howling at Church Farm, and then at Park Farm for 44 years. He also worked tirelessly for the church and is remembered by an offertory dish in his memory, decorated with marquetry by Richard Cox, another parishioner. (Taken from a newspaper) and his old milking stool which he used prior to about 1940. Dorothy Curl moved last month, September 2011, from Tanglewood, the sweet cottage with Gothic windows and a fertile,intriguing garden full of unusual and beautiful plants, to an even smaller cottage in Grimston, where she'll be near her son and the amenities lacking in Bilney. So ends a connection of over 100 years of Curls and West Bilney. Dorothy's late husband, Douglas, was born at Tanglewood, and of his eighty years, only nine and a half were spent away from Bilney. His forbears were Bilney men who fought in the Great War. At least the remaining Curls aren't far away! Our best wishes for your new life, Dorothy.